It looks like it just added the additional row for the fifth employee. That's not true, it effectively teared down all the <tr> and <td> elements of all the employees and recreated them. To confirm this launch browser developer tools by pressing F12. At this point click the "Refresh Employees" button and you will notice all the <tr> elements are briefly highlighted indicating they are teared down and recreated. This happens because Angular by default keeps track of objects using the object references. When we click "Refresh Employees" button we get different object references and as a result Angular has no choice but to tear down all the old DOM elements and insert the new DOM elements. Angular can avoid this churn with trackBy. The trackBy function takes the index and the current item as arguments and returns the unique identifier by which that item should be tracked. In our case we are tracking by Employee code. Add this method to employeeList.component.ts. At this point, run the application and launch developer tools. When you click "Refresh Employees" first time, only the the row of the fifth employee is highlighted indicating only that<tr> element is added. On subsequent clicks, nothing is highlighted meaning none of the <tr> elements are teared down or added as the employees collection has not changed. 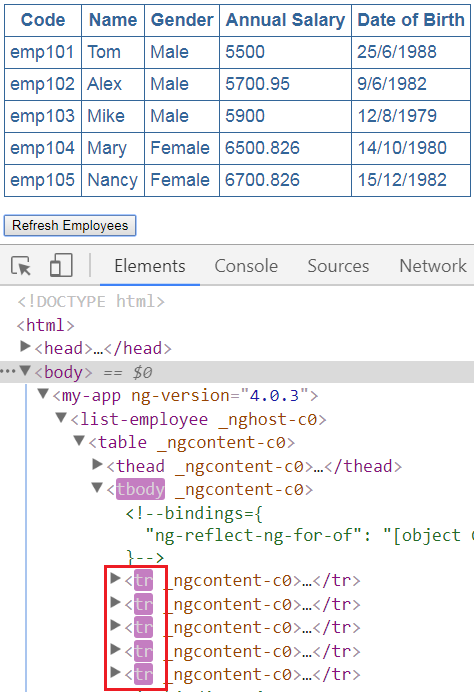 Even now we get different object references when we click "Refresh Employees" button, but as Angular is now tracking employee objects using the employee code instead of object references, the respective DOM elements are not affected. How to get the index of an item in a collection : Notice in the example below, we are using the index property of the ngFor directive to store the index in a template input variable "i". The variable is then used in the <td> element where we want to display the index. We used the let keyword to create the template input variable "i". The index of an element is extremely useful when creating the HTML elements dynamically. We will discuss creating HTML elements dynamically in our upcoming videos. Identifying the first and the last element in a collection : Use the first and last properties of the ngFor directive to find if an element is the first or last element respectively. Modify the code in employeeList.component.html as shown below. Identifying even and odd element in a collection : This is similar to identifying first and last element in a collection. Instead of using first and last properties, use even and odd properties. Hello sir. Thanks a lot for your videos. Can you please explain how the input variable for trackByEmpCode method is getting passed in the tr ngFor ? To the trackBy method no need to pass index, i think. Current item is only needed. Please correct me if I am wrong. IN the above example , how is the first and third row employee "Even" , rather it should be "Odd" right ? Vice-Versa is true when you see the "Odd" ones should be "Even" in this case .